Petform (Pvt) Ltd., the giant of the plastic and paper based packaging industry, bagged two Silver Awards from the ‘Entrepreneur of the Year’ Awards Ceremony, organized by the Federation of Chambers of Commerce and Industries in Sri Lanka. Perinpam Mathitharan, MD, Petform (Pvt.) 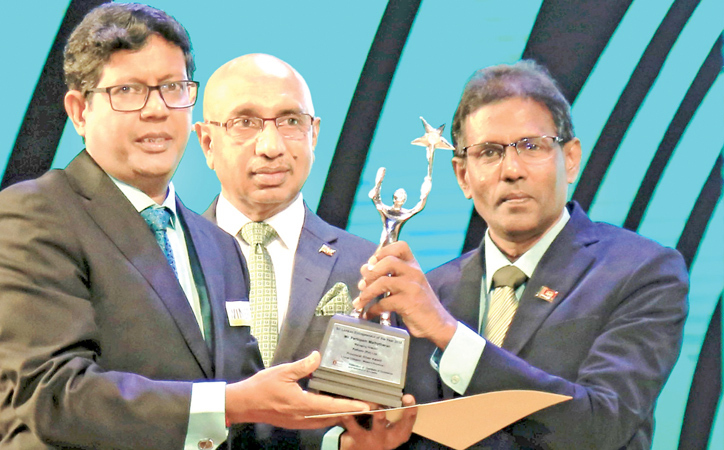 Ltd., received the two Silver Awards respectively, for the Large Category, National Level and Large Category of the Western Province, at the gala event held recently at the BMICH. Petform, which specialized in the manufacture of PET bottles & lids and paper based cups & plates, has 4 plants in Delgoda and Malwana with a workforce of over 200. The company exports its products to the UK, Saudi Arabia and the Maldives. Petform is known for its high quality products and accredited with quality certifications ISO 9001:2015, ISO 14001:2015, ISO 18001:2007 and SLS 1336. Mathitharan expressed his gratitude to his employees who had dedicated themselves tirelessly for this achievement and the company’s stakeholders without whom the journey towards success would not have been possible. Having started as a small factory in 2004, Petform has come a long way to become the largest packaging solutions provider in Sri Lanka, catering to a wide range of medium to large scale industries, including bottled water, food and beverage, cosmetics, pharmaceuticals and agro chemicals. Pursuing the art of creating the best packaging solution to protect the freshness of the product while offering it the best visual representation, the company is dedicated to value addition to the customers by creating eco friendly, innovative and end user oriented packaging solutions, with minimal impact on the environment. Petform is continuously investing in new technologies and researching on new raw material that would help reduce the company’s carbon foot print. While the company produces only fully recyclable products, based on green manufacturing philosophy, it hopes to go a step further to use raw material decomposed by nature itself.